Remember Mike Tyson's Punch Out? It was my brother's favorite Nintendo game when we were growing up. And while I have to say I hated that game, Sugar Cosmetics 'Round the Clock Eyeshadow Palette in Punch Out is a total knockout. While browsing at Sephora yesterday, I came across this palette of colors in bright, eye-popping shades and literally stopped in my tracks, staring slack-jawed at the shades before me in total awe and amazement. I simply had to buy it, take it home and try all the colors immediately. (See the photo at left for swatches.) I was pleasantly surprised to discover that while the colors all look really bright -- most not wearable for the office, I thought -- they go on much sheerer than they appear! My favorite shades are definitely the two greens and the blue -- I am a huge fan of wearing brights when I go out, and I simply can't wait to wear these the next time I'm out on the town! 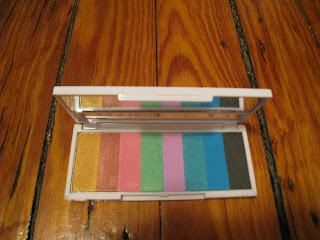 Even more, I'm totally loving the layout of the palette, with each color seamlessly melding from one to the next. It just looks gorgeous! Intrigued? You can pick up your own for $28 on Sephora's website. You're sure to be the last one standing with this in your arsenal!